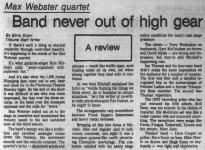 If there's such a thing as musical creativity through controlled insanity, it's happening in the minds of the Max Webster quartet. It's what guitarist-singer Kim Mitchell calls "semi-organized schizophrenic fun." And it's also what the 1,500 young Winnipeg fans came out to see, hear and cheer for in the Playhouse Theatre Monday night. By the end of the show it was difficult to see who was more impressed, the fans over the three encores, or the band over the incessant applause and the calls for "more." Max Webster rolled out on to the stage in overdrive and mantained the frenetic speed to the last sustained note of the third encore. 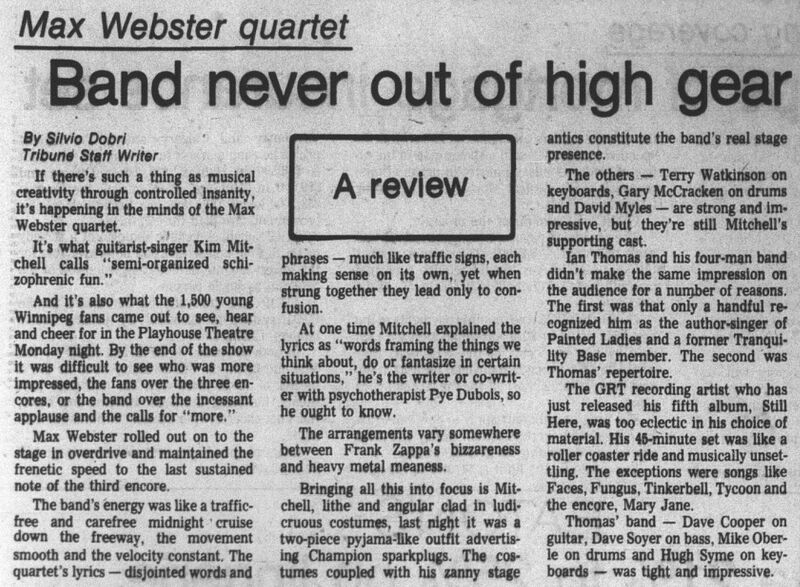 The band's energy was like a traffic-free and carefree midnight cruise down the freeway, the movement smooth and the velocity constant. The quartet's lyrics — disjointed words and phrases — much like traffic signs, each making sense on its own, yet when strung together they lead only to confusion. At one time Mitchell explained the lyrics as "words framing the things we think about, do or fantasize in certain situations," he's the writer or co-writer with psychotherapist Pye Dubois, so he ought to know. The arrangements vary somewhere between Frank Zappa's bizzareness and heavy metal meaness. Bringing all this into focus is Mitchell, lithe and angular clad in ludicrous costumes, last night it was a two-piece pyjama-like outfit advertising Champion sparkplugs. The costumes coupled with his zanny stage antics constitute the band's real stage presence. The others — Terry Watkinson on keyboards, Gary McCracken on drums and David Myles — are strong and impressive, but they're still Mitchell's supporting cast. Ian Thomas and his four-man band didn't make the same impression on the audience for a number of reasons. The first was that only a handful recognized him as the author-singer of Painted Ladies and former Tranquility Base member. The second was Thomas' repertoire.——The GRT recording artist who has just released his fifth album, Still Here, was too eclectic in his choice of material. His 45-minute set was like a roller coaster ride and musically unsettling. The exceptions were songs like Faces, Fungus, Tinkerbell, Tycoon and the encore, Mary Jane. Thomas' band — Dave Cooper and guitar, Dave Soyer on bass, Mike Oberle on drums and Hugh Syme on keyboards — was tight and impressive.